Gen III is first and foremost a cleantech company, that is building a green project that has compelling economics, without government subsidies. 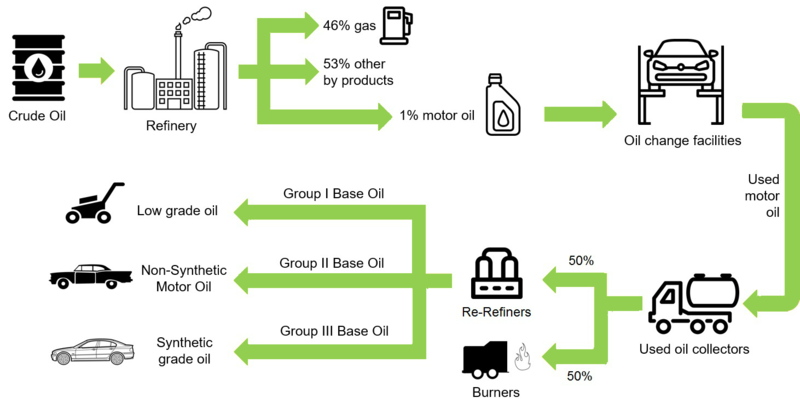 Gen III owns a portfolio of patented technologies that enable used motor oil (“UMO”) re-refineries to produce a higher value product mix of base oils than traditional methods. Our technology has been validated in two independent pilot plant tests and by Stantec Consulting Ltd., WSP Canada, Wood Group Mustang, U.S. Department of Energy Oak Ridge Laboratory, Tetra Tech, Process Dynamics Inc. and Koch Modular Process Systems. The American Petroleum Institute, categorizes base oils into five main groups: I, II, III, IV and V. This breakdown is based on a combination of the refining method and the base oil’s properties in terms of viscosity, the proportion of saturates and the sulfur content. The majority of traditional refiners only produce Group I through Group II+ base oils, which are used to formulate motor oils for older passenger car engines or for use in some industrial applications. Refineries currently produce only a small proportion of Group III, often referred to as synthetic oil and there is only one re-refiner in North America, currently producing 400 bpd of a low-grade Group III. Gen III’s ReGen™ technology, produces a 55% yield of Group III, which is a high margin base oil used in the formulation of performance synthetic grade motor oils. Group III base oil is the fastest growing group of base oils as more automakers require the use of better-quality motor oils and consumers continue to switch to synthetic grade motor oils. Our re-refinery technology requires lower initial capex and ongoing opex over a traditional refinery, yet it yields higher margin products. For example, posted prices for Group III oil (13 February 2019) are at a 70%+ premium to Group II. 1. Signed letters of intent for the supply of more than our annual requirement of UMO feedstock. 2. Secured a CDN$114.5 million fixed price for construction from our EPC partner, PCL Industrial Management Inc.
3. Signed marketing offtake agreement for 100% of our annual production with Elbow River Marketing Inc, a subsidiary of Parkland Fuels. 4. Engaged senior UMO industry experts with operational expertise in re-refining and logistics. 5. Received a CDN$72 million senior debt facility term sheet for >50% of our project funding requirement received from Export Development Canada. Based on the project product outputs contained in the engineering reports and today’s commodity pricing, in the first full year of steady state production following commissioning of the Bowden re-refinery, Gen III projects recurring annual revenue of approximately CDN $170MM. This revenue is projected to produce recurring annual EBITDA of approximately CDN $85MM from an initial investment of CDN $114.5 MM. (see Forward Looking Statements and Non-GAAP measure disclaimers). Re-refining UMO transforms it back into high quality base lubricating oil. For every barrel of crude oil that is refined, under 1.9 liters (½ gallon) of lubricant is produced contributing to a total 3:2:1 crack spread (approximate gross profit margin) of only CDN $22.64/barrel, according to the Energy Stock Channel (using a US/CDN FX rate of 1.35x). The ReGen™ process produces 119 liters (31.5 gallons) of lubricant per barrel of UMO with a corresponding net income to Gen III of $86/barrel. The difference in re-refining versus refining economics is profound. Not only is re-refining the highest value use for UMO, but it is also the most environmentally responsible because it prevents UMO’s from being disposed of improperly, or burned as a fuel. Our environmental advisors calculate that the Bowden facility’s ReGen™ process will reduce CO2 emissions by 360,000 tonnes per annum, which is equivalent to taking 76,000 cars off the road each year, when compared to the production of base oils from virgin crude.